For the past 10 years, I’ve been training Mental Health professionals to use yoga to help their clients learn how to regulate their nervous systems and build greater resilience. For me, this is one of the most profound and culture-shifting potentials of yoga – we can use these practices to learn how to increase our capacity to get balanced. And we all know that in today’s world, well…just about everyone can use a little help with that. Yoga techniques can work in the short term as soon as you learn and use them and, research suggests that with regular practice, they begin to create long-term changes in the brain and nervous system, and bias the brain toward a more positive outlook, better mind-body awareness, and a greater capacity to play nicely with others. 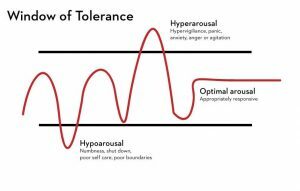 One of the models I use to explain how yoga helps (which comes from neuroscientist Dan Siegel’s work) is called the “Window of Tolerance”. The window explains that the nervous system vacillates between “hyper” and “hypo” arousal. When we can find middle ground or “Optimal Arousal” we think clearly, make good decisions, and basically feel balanced. When we are in a hypo arousal state we become rigid, depressed, cutoff, and/or avoidant. And when we are in a hyper arousal state we feel a sense of chaos – agitation, anxiety and/or anger and rage. Oh, and BTW, there are many windows in our lives. For some folks a screaming TV or child and getting cut off in traffic poses no distress, but a disorganized flatware drawer might set them off. Clearly, everyone has different levels of tolerance about different things in their lives. For some people, some of these windows are barely cracked open. The process of widening these windows is the process of developing greater resilience. Well yoga, through its four main “process tools” (ethical engagement, breathing practices, mindful movement, and meditation) offers a comprehensive system to widen those windows of tolerance both cognitively, and via the body/nervous system – or what the neuroscientists call both “Top down” and “Bottom up” self-regulation. Don’t worry if you miss it, the replay will stay up on my Subtle Yoga with Kristine Weber page. And if you want to really get down into the nuts and bolts of it all, check out my courses: The Science of Slow and The Yoga and Neuroscience Connection. I’ll bet you have a best friend, a mother-in-law, a client, or someone in your life who you know would benefit so much from yoga practice but who doesn’t think he or she has the right…(fill in the blank – body, clothes, etc.) to do yoga. So I created the Subtle Solutions to Soothe Anxiety and Stress Kit for your doubting, anxious, but really-in-need-of-yoga friend, relative, or client – but it’s also for you on those days when you need some stress relief but don’t feel like doing a strong practice. A fine idea! So then I wrote an ebook and recorded a Yoga Relaxation (Yoga Nidra) script. And I’ve wrapped it all up in a nice package for you, your clients, and your stressed out relatives! Here’s a link to more information about the kit. I’m still posting, almost daily, short videos of breath centric asana variations on Instagram and Facebook. Lots of people have written to tell me how much these posts are helping them personally and several teachers have let me know how much the videos are helping them enliven their classes. Feeling a little stressed this season? Here’s a blog I wrote today about the necessity of utilizing yoga during times of increased stress. Hope it helps!